"After further review we have determined that your drawing EX 14 dated October 5th, 2009, inappropriately indicates the eastern bank of the river as the edge of the navigational channel. Based on the new information...your facility will create a navigational hazard to other users of the channel. The moored barge or barges as proposed would result in a violation of the federal anchorage regulations." This image is the same one posted on Dutra's website. Following are the results of the most recent public survey of the proposed Dutra asphalt plant at Haystack Landing. Opposition to the proposal has grown more than 11% over the past year. 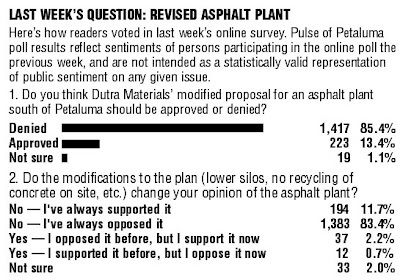 85.4% think the modified proposal for an asphalt plant should be denied. On 1.29.09, 73.8% thought the initial proposal for an asphalt plant should be denied. Click here for more Citizen Videos! The Coast Guard has submitted a letter to the Supervisors asking to investigate Dutra's proposed barge off-load facility at Haystack Landing further. This has prompted the postponement of Tuesday's hearing. New date: Tuesday January 12th. More detail to follow shortly. TUESDAY HEARING POSTPONED! Carrillo still undecided? COME ONE COME ALL! 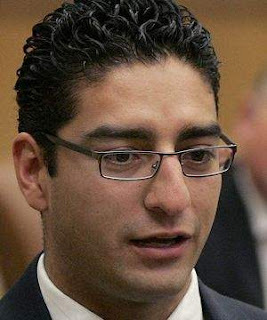 Swing vote Efren Carrillo wants to hear what the public have to say about the Dutra asphalt plant this Tuesday! Carrillo said Friday he wouldn't deliver an opinion on Dutra's revised proposal until he's heard what the company and the public have to say Tuesday. "There are still questions to be asked on the project and that's what Tuesday's hearing lends itself to," he said. Join us and express your feelings about an asphalt plant being located next to an environmental asset, Shollenberger Park and the adjacent wetlands that citizens of the County and visitors alike have a right to enjoy. Energy-Raiser Event, Sunday 12/6 JOIN US! The FINAL Supervisors Hearing on the Dutra Asphalt Plant proposal is Tuesday December 8th! It is crucial for the community to turn out in large numbers to stand up for our environment and against this project. In preparation for the final hearing, we are having an Energy-Raiser Event on Sunday December 6th, from 4-6pm. Join us at our Headquarters for exhilarating music, delicious food, inspiring conversation and short informational talks by those leading this grass roots fight! R N M properties owns and manages more than 1.5 million square feet of high quality office and retail space in San Francisco, Santa Clara and Sonoma Counties. With additional land holdings that will accommodate another 830,000 square feet of office, hotel or retail space, RNM Properties is prepared to develop and manage real estate projects in prime Northern California locations for progressive and growing companies doing business in a wide variety of industries. "On behalf of RNM Properties, I write to add my voice to those who oppose the siting of the Dutra plant on the Petaluma River. While I can appreciate the site’s attractiveness to Dutra, I perceive very marginal economic benefit to the county or to Petaluma. To undermine this unique wetlands ecosystem for such a use seems misguided and short-sighted. Our firm accomodates many businesses located in close proximity to the wetlands preserve. One of the main draws for these companies is the opportunity for their employees to enjoy Shollenberger Park. The noise and other impacts of this project will compromise the bucolic setting and be a detriment to a cohort of valuable corporate citizens." NEW PUBLIC SURVEY ON DUTRA PLANT: TIME SENSITIVE - VOTE NOW!! This is a new survey by the Argus about the so-called "revised" Dutra Asphalt factory at Shollenberger Park and the River. It's no doubt intended for print next week, if not tomorrow (Thursday). Tell your friends and neighbors too! Dutra will try to make it look like all of Petaluma likes their 'new' plant - unless we speak up. Dutra Materials wants to build an asphalt plant on the banks of the Petaluma River and 350 ft. from the walking paths of Shollenberger Park. The Petaluma City Council and our Mayor are unanimously opposed to this project! Additionally, a recent poll showed 84.5% of the citizen respondents are also opposed. Yet three of the five County Supervisors are inclined to vote to permit this factory to be located in this Voter Mandated Scenic View Corridor. You can help protect this scenic wildlife preserve and wetlands by sending them your letter, stating how you value wetlands and scenic beauty and that this translates into longterm economic vitality for Sonoma County. (See template below). Contact the Supervisors and Tell Them to Vote NO! The final vote is January 12th!! Here is a standard letter script you can use if you'd like. We encourage you to expand it and make it personal. I am often a visitor to beautiful natural destinations and Sonoma County is one of them. I'm writing to ask you to preserve and protect Sonoma County's wetlands by voting NO on the Dutra Asphalt Plant proposal at Haystack Landing. I plan to visit Sonoma County because of its natural beauty and commitment to a healthy environment. Please vote NO on the Dutra Asphalt Plant and you can be sure many tourists will thank you and will visit Shollenberger Park and Sonoma County. The Petaluma Wetlands Alliance (PWA), a committee of Madrone Audubon, is dedicated to the creation, restoration and stewardship of publicly accessible wetlands and wildlife habitats. We support Shollenberger Park, Alman Marsh, the new wastewater treatment property, and future wetland sites in the watershed. PWA works with local governments, environmental organizations and other groups to educate the public about the ecology and value of wetlands.